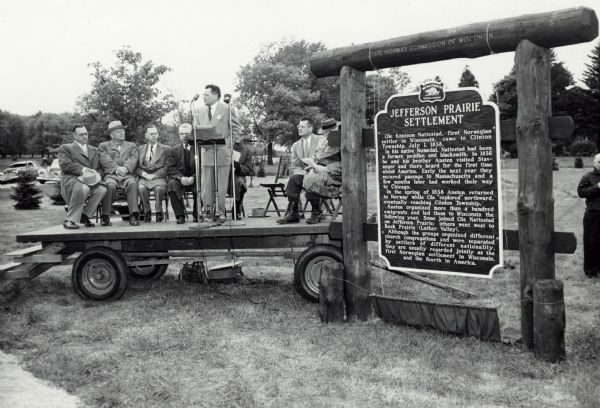 Jefferson Prairie Historic Marker, 1952. Would you like to visit the birthplace of the ice cream sundae, where the creator of the Betty Boop character got his start, or perhaps follow in the footsteps of Abraham Lincoln during his army days in the Black Hawk War? History is all around us, if you only know where to look. To discover Wisconsin's rich history and culture, just find an official Wisconsin Historical Marker. These historical markers tell the stories of historical, archaeological, geological, or legendary events at the local, state, and national level. Wisconsin has over 575 registered historical markers, each with its own unique tale to tell. From the Apostle Islands at the very top of the state to the first point of survey in the south, these historical markers are your keys to unlocking the history of Wisconsin. Marking sites of significance is a long-standing tradition, and each community has its own method of commemorating and celebrating the importance of local persons, events, and places. 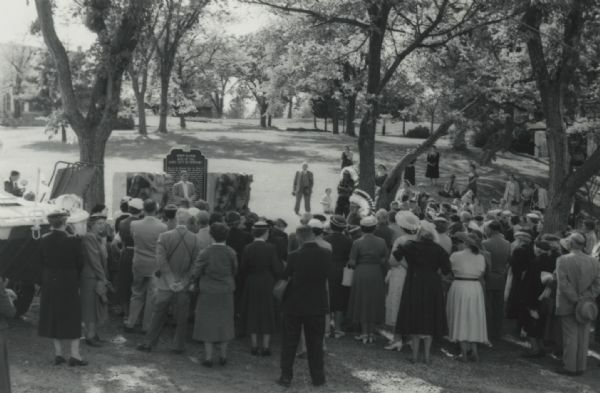 Wisconsin's Historical Markers Program was born out these local efforts as a means to establish markers that educate the public about the importance of remembering who we are and where we come from. In 1943, the Director of the State Historical Society, Edward P. Alexander, approached Wisconsin Governor Walter Goodland about creating a system that would unite the histories of these various communities under the same historical marker design. Governor Goodland appointed the first Historical Markers Committee, which from 1943 to 1951 approved nine uniform historical markers across the state. 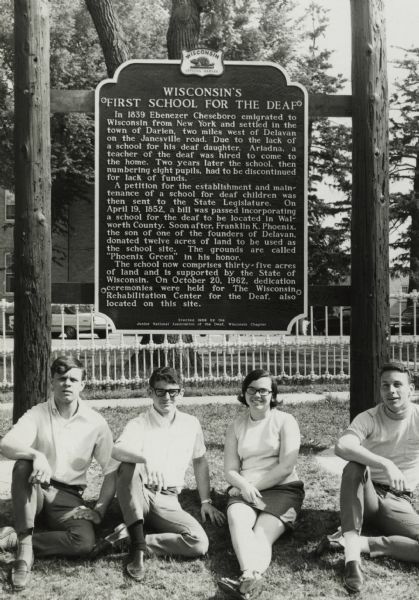 Wisconsin's First School for the Deaf Historic Marker, 1969. The Historical Markers Committee was reimagined in 1950. A new committee was established whose goal was to "strengthen the respect and understanding of our great region." The newly formed Wisconsin Markers and Site Committee was made up of representatives from the State Highway Commission, State Conservation Department, State Department of Public Instruction, State Planning Board, and, of course, the State Historical Society. 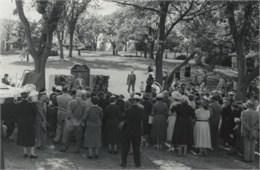 Despite the establishment of the Wisconsin Markers and Site Committee, people of Wisconsin were the true driving force behind the historical markers program. The public was responsible for nominating places of historical importance, and without their desire to preserve the state’s history, we would not have over 575 historical markers today. The committee's purpose was not to say what should be recognized or commemorated, but rather to "approve only sites of bona fide state-wide importance and significance," ensuring the markers were of interest and valuable to visitors as well to the locals. It is the passion Wisconsinites have for their state history and culture that has made the historical markers program such a success. 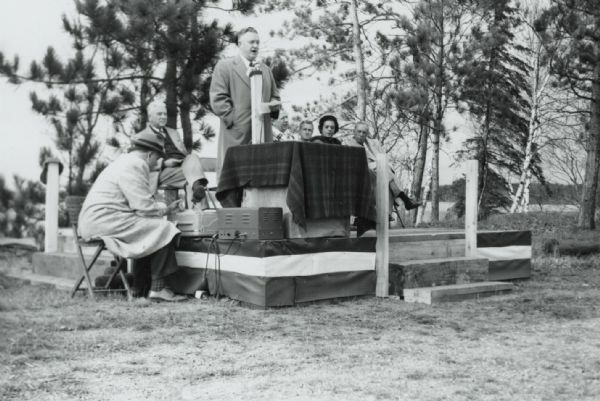 In 1953, a legislative act cemented the historical markers program and ensured its place in the future. An official seal and design had been established to denote markers recognized and approved by the Wisconsin Markers and Sites Committee and the Wisconsin Historical Society. Under the new legislation, this seal, featured on the first historical marker of the new system, the Peshtigo Fire Cemetery in 1951, was protected and given legal status. Dawn Manor Historic Marker, 1955. A meticulous approval process was established in 1950, and improved upon in 1954, in order to meet the new criteria of the historical markers program. Step 1: To start, an organization or individual had to complete an application stating what the marker commemorates and why it is of significance. Step 2: Next, professional and scientific advisors judged the importance and significance of the proposed site to determine if it was worthy of receiving official statewide recognition. Step 3: These advisors then sent their recommendations to the Wisconsin Markers and Sites Committee, who after careful consideration either gave their seal of approval or disapproval to the nomination. Step 4: Once a site had been approved, the proposal was sent back to the advising agency to draw up the text in consultation with those who nominated the site. Step 5: Finally, the local nominating organization or individual was responsible for paying and contacting the manufacturing company, while installation and maintenance fell to an operational agency. An operational agency could be the State Highway Commission or a local church, depending upon the location and subject matter of the historical marker. 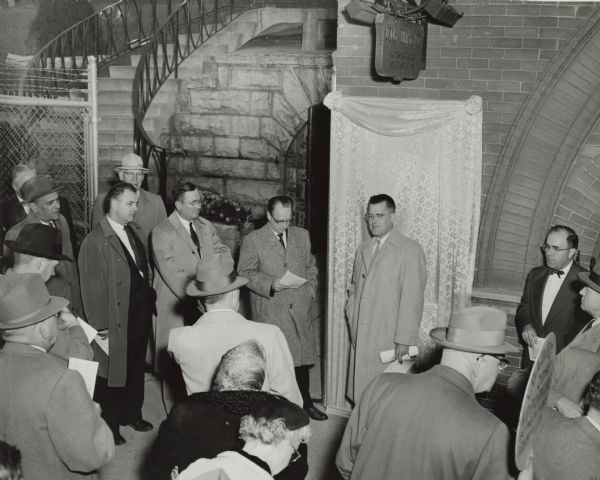 This process was established in order to ensure high quality historical markers honoring people, places, or events of true importance were erected. For decades, this process was utilized to sort through the nominations to shine a light on those that enriched the culture and history of Wisconsin. Watertown Plank Road Historic Marker, 1955. As per the new program, each marker needed to be uniform and identifiable as a part of the historical markers program. Taking their cue from the first committee, the Wisconsin Markers and Sites Committee continued the brown and cream marker design, in an effort to ensure the markers would "harmonize with their location." Two different styles were created, based on location and space available. The first, a 4.5- by 6-foot marker, was designed for rural locations, such as a wayside or a park, where space is plentiful, whereas the second is a much smaller marker appropriate for urban settings lacking abundant space. Atop each marker is the seal denoting it as an Official Wisconsin Historical Marker. The seal consists of a badger, a symbol of the state, and the words "Wisconsin Historical Marker." 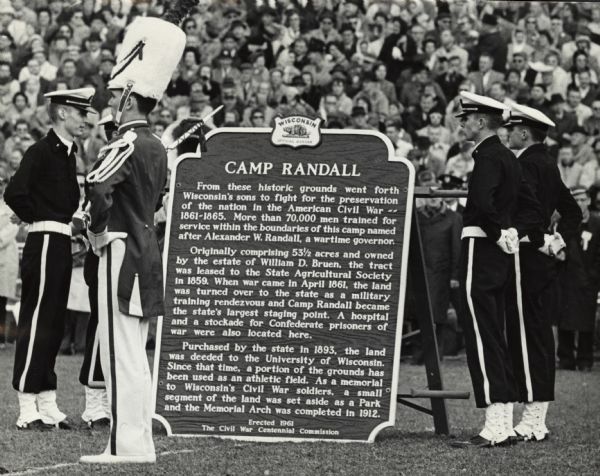 The accompanying gallery features historical photographs of historical markers. 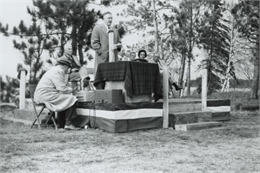 The majority of these photographs feature scenes from dedication ceremonies, beginning with the very first marker, the Peshtigo Fire Cemetery, and continuing through the 1960s, the heyday of the Historical Markers Commission. First Forest Patrol Flight, 1955. 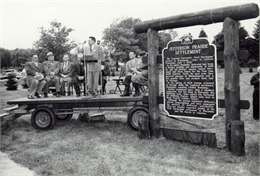 Dedication ceremonies for historical markers were often paired with other celebrations, such as anniversaries, serving to enhance its measure of historical importance. While historical markers celebrate state history, these ceremonies often highlight other local people, events or places of interest. Community bands or other such musical talents were featured as the entertainment and speakers were typically of area importance, such as the mayor, president of the local historical society, or a family member of the person commemorated. Additionally, representatives from the Historical Markers Commission were present, serving to locate the marker in the larger scheme of Wisconsin's history. Raymond Sivesind, as the supervisor of historic sites and markers at the State Historical Society, attended many of these ceremonies to join in the celebration and stress the importance of preserving history. 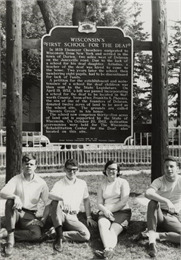 The dedication marked the end of the process and the beginning of the historical marker's function as an instructional tool in educating future generations about the history of their community. These historical markers tell the story of our collective past and connect us to history in a way nothing else can. They are a written expression of the past placed at the very location in which it took place. Although the Historical Markers Commission has disbanded, the work they started is still carried on by two representatives of the Wisconsin Historical Society. Today, there are over 575 historical markers in the state of Wisconsin, and that number is growing, so buckle up and travel the highways and byways of Wisconsin to discover history.